For the majority of the first half and the first 10 minutes of the second Thursday at the Mack Chase Athletic Complex, the Bulldog soccer team was holding its own against Class 5A Roswell High. 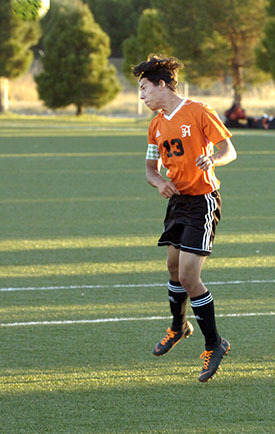 Those first moments of the final 40 minutes in particular showed what the Artesia boys are capable of, as – after producing no shots on goal during the opening half – the ‘Dogs had four quick and solid opportunities to tie things up after trailing 1-0 at the break. Artesia logged its first corner kick in the second minute, its second in the seventh, both of which were cleared by the Roswell defense. A shot in the sixth minute, meanwhile, by John Baca clanged off the east post, while another in the eighth minute was saved. That flurry of offensive activity made it all the more heartbreaking when, late in the 11th minute, the Coyotes picked up a second goal that give way swiftly to a third, effectively putting the game out of reach for the ‘Dogs. Roswell’s first goal of the second half sailed high into the corner of the net, and their hat trick came early in the 13th minute the same way their first-half score had – on a rebound following a block by Artesia keeper Aaron Natera. With 20 minutes to go in the contest, sophomore D’andre Calvillo got behind the Coyote D and used his speed to line up a point-blank shot that found the back of the net. The goal – Artesia’s first since Sept. 15 against Clovis – further energized the ‘Dogs. But despite two more shots on goal in the half, they were unable to add to their tally, and Roswell rounded out the 4-1 final with a goal on the open net at 27:23. “It had been a long time since we scored a goal, so that was good for our confidence,” head coach Phillip Jowers said today. The loss drops Artesia to 3-10 on the season, but they’ll have a solid chance to add to their win total at 1 p.m. Saturday at The Mack in their final pre-district game against Ruidoso. The ‘Dogs defeated the Warriors 6-0 Sept. 4. The contest will also be Senior Day for the team.